2017-18 FIS freestyle snowboard World Cup champion and Summit County resident Chris Corning goes for a grab during the slopestyle qualifiers at X Games Aspen in January at Buttermilk Mountain. 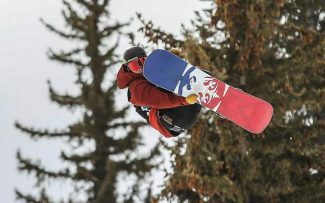 Silverthorne’s trio of elite, resident freestyle snowboarders will all return to X Games Aspen in January. Chris Corning, 19, is currently scheduled to compete in both the snowboard slopestyle and snowboard big air events while Red Gerard, 18, and Kyle Mack, 21, are currently slotted to ride in the slopestyle event. Corning, Gerard and Mack are three of 82 freestyle skiers, snowboarders, snowmobilers and snowbikers who received first-round invites on Wednesday to the annual event. The three riders are currently the only Americans invited to the X Games men’s snowboard slopestyle competition. The list of 12 slopestyle snowboarders also currently includes Yuki Kadono of Japan, Marcus Kleveland and Stale Sandbech of Norway, Sven Thorgren of Sweden and five Canadians: Mark McMorris, Tyler Nicholson, Max Parrot, Darcy Sharpe and Sebastien Toutant. In the men’s snowboard big air event, Corning is currently joined by event invitees Kadono, Kleveland, McMorris, Parrot and Toutant, as well as teen Japanese rider Takeru Otsuka. This year’s X Games will feature 75 Olympians from across the globe and runs from Jan. 24-27. Thursday’s action will include afternoon and evening qualifiers for men’s ski slopestyle and superpipe, women’s ski superpipe and men’s and women’s snowboard big air. Competition continues on Friday afternoon withthe women’s ski slopestyle final, men’s ski big air qualifiers, men’s snowboard slopestyle qualifiers and a nightcap of women’s ski and men’s snowboard big air finals. Saturday will commence in the afternoon with women’s snowboard slopestyle finals followed by men’s snowboard slopestyle finals. Saturday night will be highlighted by the men’s ski big air finals and the women’s snowboard superpipe finals. Sunday’s final day will begin with the men’s ski slopestyle final in the afternoon and will be centered around the men’s snowboard superpipe final, in primetime, at 6:30 p.m. MT. For a full list of currently-invited athletes, go to XGames.com/Events/2019/Aspen/InvitedAthletes. As for upcoming action, the International Ski Federation’s World Cup snowboard big air circuit will return on Saturday at the Modena Skipass big air World Cup competition in Modena, Italy. The first run is scheduled for 10:30 a.m. MT. The event will feature the biggest artificial jump ramp ever built in Italy: a man-made structure of steel and snow that stands 46-meters tall and 130-meters long. Corning and Gerard are confirmed to compete on Saturday.In early September, on his birthday no less, Corning won the opening event of the 2018-19 FIS World Cup season in Cardrona, New Zealand. He did so by landing, for the first time in his career, a quadruple-cork 1800, a trick that requires four inversions on a snowboarder’s vertical axis as well as five complete 360-degree horizontal rotations. Corning topped the Japanese 17-year-old teen phenom Otsuka, who finished in second place. At February’s inaugural Olympic big air event in Pyeongchang, South Korea, Mack won the silver medal while Corning and Gerard finished in fourth and fifth places, respectively.